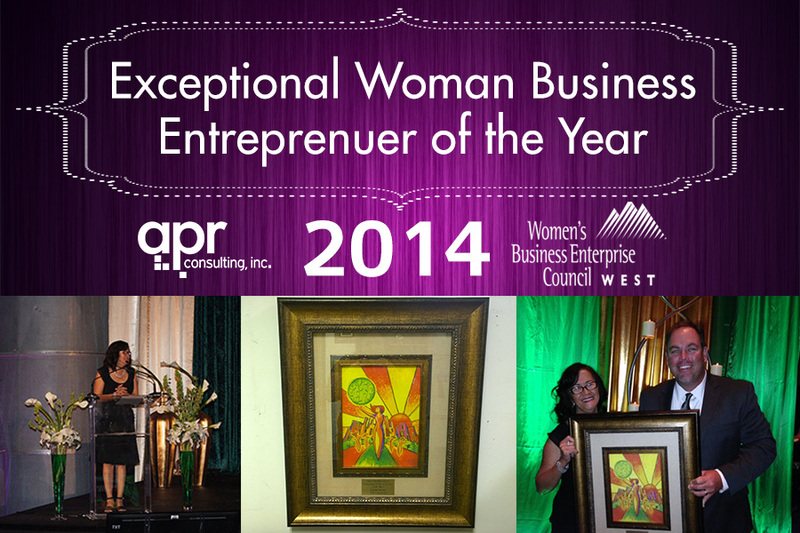 APR Consulting, Inc. (APR) is very honored and excited to have received the Exceptional Women Business of the Year Award at the 11th Annual WBEC-West Strategic Procurement Opportunity Conference, Gala awards event last Friday evening, Sept. 5, 2014. Linda Stone was the recipient of the award. The event was excellent and the participation of so many top executives, large supporting corporations and extremely talented people from many industries, made being selected for the award a very significant and humbling experience. Furthermore, being nominated by one of our top clients, Caesars Entertainment, was an honor. APR is a strong supporter of WBENC-West and we appreciate the quality it delivers to its membership, such as; superb networking opportunities, business mentorship from large corporations and valuable workshops. Along with WEBC-West, APR strives to work with many WBE’s as vendors, partners and clients and we plan to keep up this effort for many years to come. For more information on WEBC-West, visit: http://www.wbec-west.com. This entry was posted in APR News and tagged APR, APR News, Awards. Bookmark the permalink.